Butte’s Memory Book tells the story of Jim Ledford, a miner who lived in a log cabin below the famed Anaconda Mine. Alongside his cabin was an old dump containing scrap iron and tin cans. Mine water ran downhill through the dump, and Ledford noticed a heavy sludge formation. Out of curiosity, he had the sludge assayed and learned that it was 98-percent-pure copper. Legend has it that Ledford told no one about his discovery. Instead, he quietly secured a one-year contract to handle the Anaconda mine water. He set up tanks, filled them with scrap metal, and ran the water through them. The undated account said his efforts earned him $90,000 that first year. His contract was not renewed. A professional paper from a 1913 Butte mining conference tells a slightly different story. It states that in 1890 a William Ledford obtained a contract to handle water from the St. Lawrence Mine. The story ends the same, however, once the Anaconda Company realized the value of mine water, it built its own copper tanks, and copper precipitation using scrap iron became standard operating procedure. Thanks to Al Hooper for loaning his copy of the 1913 mining conference proceedings. A third version of the story was relayed in the April 18, 1906 edition of The Montana Standard as part of a series of articles on “Queer Spots in Butte.” According to this version, in 1888 an old Welshman named Morgan who lived on the Butte Hill noticed copper dust left behind from tin cans thrown into a gully filled with runoff water from the mines. Morgan had the dust assayed and learned that it was almost pure copper. He experimented with the concept and developed a rudimentary precipitation plant, but died a few months after he had his plant operating successfully. The story goes on to claim that a Butte Dutchman named Fred Miller dug holes in the side hill in the gulch below the St. Lawrence mine. He filled these holes with tin cans and scrap iron, allowing mine runoff water to flow over them. For the next two or three years, he would collect the resulting copper dust every few weeks. Miller fraudulently claimed a monopoly on this system, and on several occasions tried to bluff out others on the hill who were experimenting with precipitation. The story notes that at this point William Ledford secured a lease to the St. Lawrence water, and Miller’s heyday came to an end. Montana Resources copper precipitation plant adjacent to the Berkeley Pit. A 2013 slough of material from the Pit wall into the water knocked out the ‘precip’ pump, and precip operations have since ceased. In precipitation, the copper-rich water is pumped over scrap iron, and, in a replacement reaction, the copper solidifies as sludge, while iron takes its place in the water. The water was returned to the Pit by gravity flow, thus not increasing or decreasing the total volume of Pit water. This method of copper recovery was not new: it dates back to medieval Europe. The Anaconda Company used it for years to recover copper from the water pumped from the underground mines, and the method is still used today. 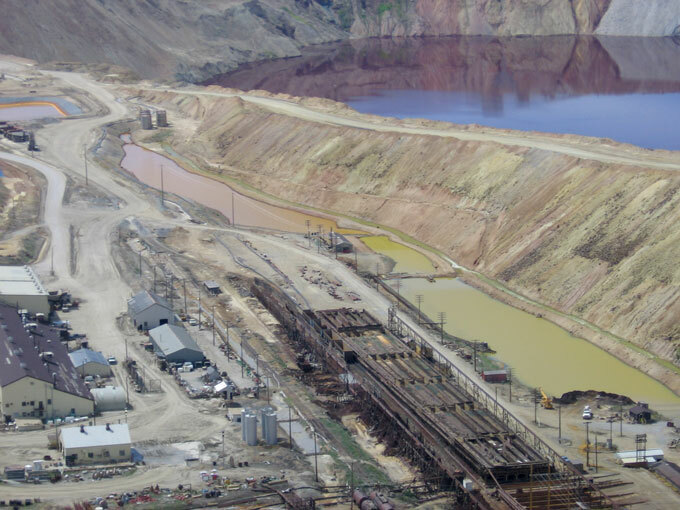 Montana Resources has mined copper from the rich mineral waters of the Berkeley Pit since 1998, pausing when mining operations were suspended from 2000 through 2003, then resuming in 2004 until a Pit slough in 2013 knocked out the necessary pump. The mine pumped out roughly 13 million gallons of Pit water per day, or about 10,000 gallons per minute. In copper precipitation, the Pit water is piped to the company’s precipitation plant, built in the 1960’s next to a similar one from decades earlier. The water flows into concrete cells filled with scrap iron, and then chemistry takes over. Simply put, the iron in the cells and the copper in the water trade places. The water is returned to the Pit with a higher iron content, and the copper precipitates, or solidifies out of solution, clinging to the remaining iron. 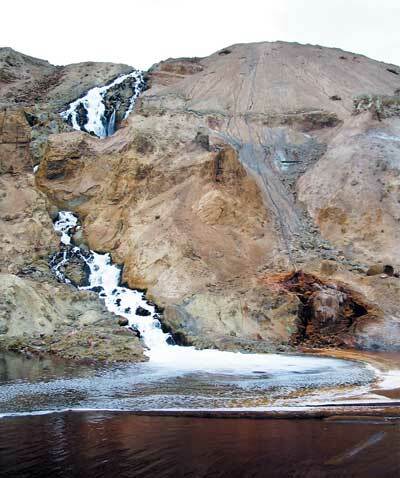 The waterfall formerly visible on the southeast rim of the Pit, seen here in 2004, created by returning Pit water that has gone through Montana Resources copper precipitation plant. The chemical reaction does not take long. Water stays in contact with the iron for only about an hour, and then it flows back into the Pit through a separate ditch along the old Horseshoe Bend channel, which could be seen from the viewing stand as the waterfall on the northeast rim of the Pit. 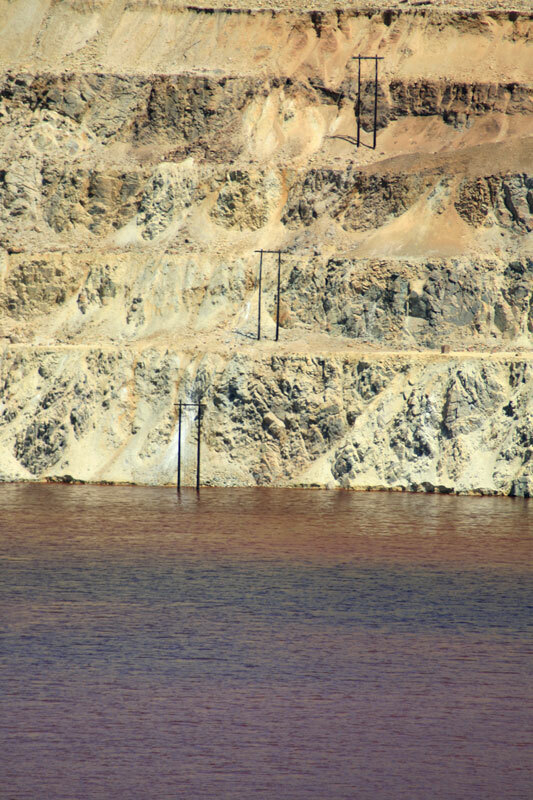 Mine officials say that this constant circulation process should not affect the water level of the Pit, nor should the change in water chemistry have an effect on eventual water treatment operations. Once per week, crews drain each cell to recover the precipitated copper. A front-loader scoops up the copper and scrap iron mixture and transports it to a vibrating screen. Water sprayed from high-pressure hoses knocks the copper through the screen into a tank below. Remaining iron goes back to the cells for reuse. The cement copper concentrate is then shipped to the concentrator and processed through a filter press to reduce the water content for rail shipment. By pumping water from the Berkeley, the company recovered about 400,000 pounds of copper per month. The company also routed copper-rich Horseshoe Bend water through the precipitation plant from 1998 until the mine shutdown of 2000. The sale of this precipitated copper helped to offset water treatment costs. Once through the precipitation plant, Horseshoe Bend water was mixed with lime (calcium hydroxide) and pumped north to the Yankee Doodle Tailings Pond. Since the treatment plant went online in 2003, this Horseshoe Bend water has been kept out of the precip plant circuit. Hi my name is hannah I am in 5th grade and I go to Silver Bow Montessori and i am doing a science fair project on metal ionic exchange using an electrolyte to collect copper onto iron. I am interested in how this kind of process has been used to “mine” copper from the pit. do you have any other source of information about this process?